Any updates on the DNR version? I can’t wait to get my hands on it. Several wookiees on Kessel had totally bald faces. Are they supposed to be female? So I have Battlefront II, and I’m trying to find if there’s a two player splitscreen starfighter battle. Is that hidden somewhere in the game, or am I possibly stupid? Did we ever get a comparison gallery of all the changes to ESB-R? You are right! THANKS SO MUCH ADYWAN!!! That’s very offensive. Stevie Wonder does a much better job of color grading. Does anyone have a link to some alternate hi-res R1 blu ray covers for Rogue One? I got the standard US version, and the red TIE lasers are really getting on my nerves. I’d settle for the same thing with green lasers. A bit of a tangent, but what was the purpose of finding Luke anyway (other than being the macguffin of the movie)? He’s been gone 30 years, and now he’s needed all of a sudden. Why? Is it to help fight the First Order? I don’t recall that the movie ever explained this. This movie had its flaws (characters could be a little more developed), but some of you are being way too harsh. Don’t get me wrong - I appreciate a good lively discussion. But it’s like some people want to cut it apart in whatever way they can. FWIW, I enjoyed the movie, even more so on my second viewing. I do wonder what the original cut would have been, and if I would have liked it more. But we got a good Star Wars movie, which captures the spirit of the original Star Wars better than any movie has in a long time. I haven’t really seen much mention of this, but this movie really brings back the Force as a tool for the everyman, not just the members of the midichlorian club. Chirrut isn’t a Jedi, but the Force “flows through him” and “controls his actions.” I bet this is a big part of the Star Wars philosophy that Disney wants to project - and I have absolutely no problem with that. Star Wars is big - there are so many different kinds of fans. It’s sometimes tempting to try and see who is a bigger fan, but I’ve come to see that’s a pointless pursuit. I love the OT, Kenner toys, and most of the 90s video games and comics. I’m in the 501st. I’m a Star Wars fan. I have a friend who’s younger than me who loves the prequels, Clone Wars, Rebels, and TFA. He’s a Star Wars fan. I have coworkers who read all the novels. They’re Star Wars fans. I have a coworker who loves the movies, but struggles to remember what order they go in, or some details and names. He’s a Star Wars fan. Sometimes it’s hard not to judge. But it’s really pointless in the end. I’m not sure, but I wanna say it was a direct copy from a disk. I think I also gave none a copy years ago. While Star Wars never left the public eye, it wasn’t much of a kids thing between 1985 and 1995 (the dark times). There were no toys in the stores, but there were novels, graphic novels (not comic books), and HARD video games. I would argue Star Wars matured into an adult fandom at this point. And as hard as it’s tried to go back to being just a kids thing, I don’t think it can. Also note, armor is ROTS, and helmet… maybe an ESB with ANH colors. Again, not a Vader purist. Overall things are looking pretty good. There is nothing on the armor suggesting it’s ROTS. The OT chest armor was three pieces: one for the chest and two separate shoulder pieces. ROTS had this single unsightly piece that included the chest and shoulder armor all together. The shoulders here are covered by the cape, so at this point it’s unclear what the armor is. The outer robe here is worn under the armor, as it was in ROTS, TESB, and ROTJ. I can understand why they made this change, as Vader simply looks more aggressive with the armor on top of the robe. The chest box is accurate to ANH (and ROTS) since it has the green button. The helmet is a little hard to make out. The true calling card of the ANH helmet is the widow’s peak. I think I can vaguely make one out here, but it’s hard to be sure. 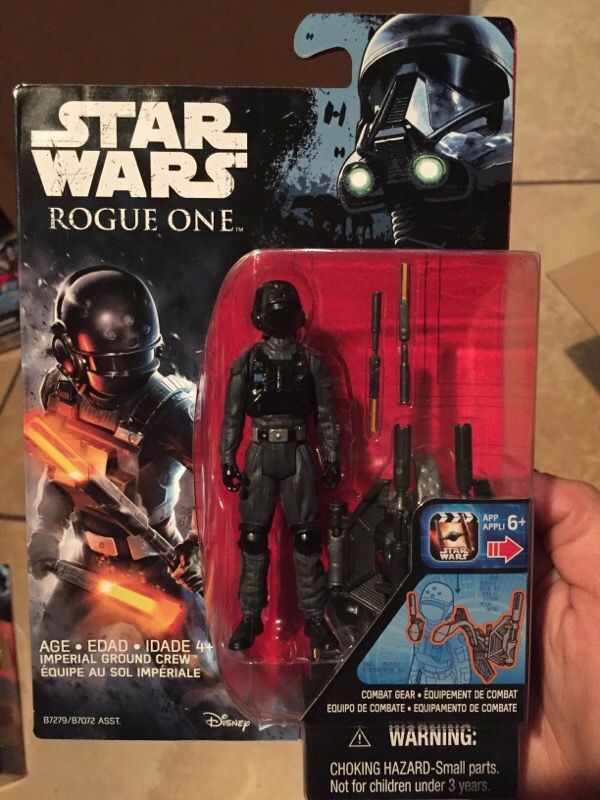 The reason we’re getting this figure is, this is the imperial costume (minus the helmet) that Jyn wears at the end of the original Rogue One trailer. It even comes with those batons she likes to fight with. After the debacle of the “new trailer” that was supposed to premiere during the Force Awakens TV special a few weeks ago, I’m definitely not getting my hopes up for this.